A colorful life on Oahu extends far beyond its beaches. Known as “The Gathering Place,” the island has long been home to artists from every genre. 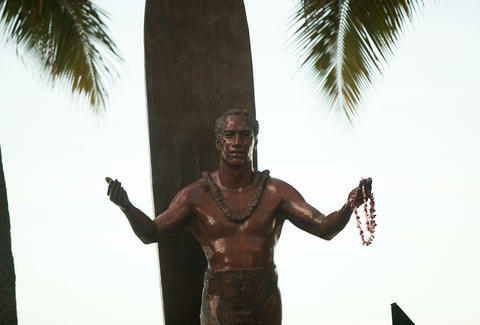 The bronze statue of champion swimmer and surfer Duke Kahanamoku on Kuhio Beach stands for the spirit of aloha, symbolized by his open arms -- and the landmark is just one of many welcoming works across the island. Creativity and culture abound beyond Waikiki, though, so check out these luminaries of art and culture. Whether you’re looking to buy locally curated artwork or take classes to produce your own, Oahu has you covered. This regular weekend event in Waikiki is 65 years old -- and not even thinking of retirement. Located along the Honolulu Zoo fence (hence the name), it’s a place to percolate over paintings, photography, and other prints, but the real value lies in being able to meet and mingle with the artists and hear their inspirations firsthand. Tip: visit before 2pm, as some artists pack up and leave early. A good cocktail can be a work of art, but Manifest hedges its bet with fine art exhibits. By day, the space located in historic Chinatown is an art gallery and café (serving locally sourced espresso beans), but by night it transforms into a cocktail bar featuring Honolulu’s best whiskey selection. These hard-partying art lovers curate six shows a year featuring local artists. And their cocktails? Yeah, they’re art too. A fine art gallery showcasing more than 450 local artists, it fosters a uniquely Hawaii art style across all media. The collection ranges from 150-year-old projects to contemporary work, with the criterion that creators have an authentic connection to the island. Pieces include old greats like D. Howard Hitchcock, Lionel Walden, and Madge Tennent, while current artists include Kim Duffet, Tadashi Sato, and Satoru Abe. Pretty remarkable for a gallery that’s just 16 years old. Known as an “artist’s artist,” Louis Pohl cultivated Hawaii’s modern art scene. In addition to his range of work from cartooning to illustration to painting, Pohl was a teacher and mentor whom the Hawaii State Legislature designated a “Living Treasure of Hawaii” in 1994. The gallery promotes residential and Hawaii-connected artists, offering an artists-in-residence program of thoughtfully selected innovators. Established by mother-and-daughter duo Gail and Laurie Baron in 1990, this family-run gallery has in recent years become a perennial vote-winner for “Best Honolulu Art Gallery” by readers of Honolulu Magazine. Nohea sells original paintings and prints, turned bowls, furniture, jewelry, ceramics, Hawaiian woods, and more. A mainstay on the island since 1983, Pegge Hopper foregoes models for her distinctive paintings of island women, preferring an image or “icon” in her head to represent Hawaii’s many cultures and forms of femininity. Taking place at SALT at Our Kakaako, Honolulu’s epicenter for culture and innovative events, this unique collaboration brings local artists, developing entrepreneurs, crafters, and cultural practitioners together in 85,000 square feet of space. Its sole purpose is exploration and engagement to allow new ideas to converge. Many of its projects benefit the education of Hawaiian children via the Kamehameha Schools trust, giving kids a modern education also focused on stewardship of the land. A great cultural crossroads stop to see the state of Hawaii’s modern art. You don’t need to wait for a rainy day to visit the many first-class museums in Honolulu -- but that’s a good idea, too. A showcase of Hawaiian history and culture through contemporary and retro art, these three small rotating galleries have become a main attraction since opening in 2002. Located inside the historic No. 1 Capitol District Building, admission and events are free, if you’re looking for a budget option. For 128 years, the largest natural and cultural history institution in Hawaii has boasted collections, research projects, consulting services, and public educational programs. As “stewards of over 2 million cultural objects and over 22 million biological specimens,” it’s a foundational institution in the interests of Native Hawaiians. Current exhibit you can’t miss: Holo Moana, a look at the voyaging revival. Founded in 1927, the centrally located museum is housed in two of Honolulu’s most beautiful buildings, the Japanese-influenced Spalding House and a mission revival building designed by famed architect Bertram Goodhue. 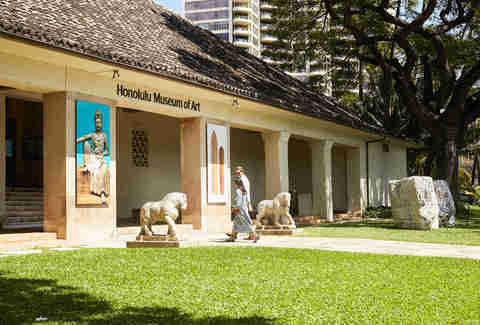 The Honolulu Museum of Art is Hawaii’s largest private presenter of visual arts programs, with international caliber exhibitions and collections of more than 50,000 works spanning 5,000 years. We’ll say that again: five millennia. It also hosts ARTafterDARK, a monthly theme party on the last Friday of every month (January - October), where more than 2,000 people enjoy food, drink, art, and DJ sessions. Through exhibitions and educational initiatives, Shangri La serves as an introduction to the world of Islamic art and architecture. Built in 1937 as the Honolulu home of American heiress and philanthropist Doris Duke, Shangri La was inspired by her extensive travels, most notably across India, Iran, Morocco, and Syria. The collection features more than 2,500 pieces and hosts artists in residence. Collaborative communities in Honolulu band together to encourage and inspire one another in unique gathering places. The best part: you’re welcome to watch. Located in repurposed warehouses in Kakaako, Lana Lane is a vibrant commonplace for creatives of all media to create together. The group’s collaborative efforts serve as a public resource for education and creativity (like POW! WOW! and others). While membership is currently full, workshops and events abound, and the studios frequently host visiting artists. Celebrating over 50 years as the guiding light of “the clay experience,” check in here for classes and workshops to create -- or buy -- a useful and beautiful memento. Just remember the first rule of pottery: no re-enacting the finale from Ghost. Get your hands dirty at Honolulu’s botanical boutique and workshop space where co-owners Tamara Rigney and Courtney Monahan combine a love of nature and design to teach others how to create their own living exhibits. Classes are BYOB to help “keep the creative juices flowing” and range all skill levels from House Plants 101 to Poolside Flower Crowns. Over the last century, weaving has turned into an art form, creating a personal statement and identity in every piece. This member-based group offers workshops, demonstrations, sales, and even a biennial exhibition. Perhaps more than any other state, Hawaii is inclined to preserve its heritage, and the arts are no exception. If you’re visiting Oahu, here’s where to experience an authentic and cultural legacy that only these islands have to offer in the form of artisan crafts that embody local history. Family-owned and operated maker of ukulele for more than 100 years, they are world-renowned for their excellent products. Guests can take a free guided tour through the Kamaka factory to learn more about the heritage and culture Tuesdays through Fridays. 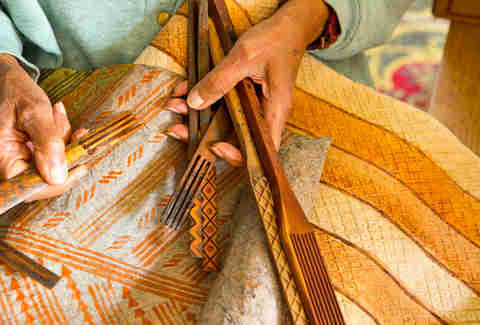 Kapa (cloths made from beaten bark) are traditional Hawaiian handicrafts. 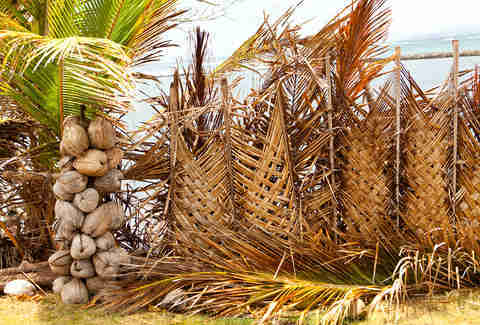 Artisan Dalani Tanahy uses natural elements like smooth warm woods and opihi shells to create her original works. She teaches classes to help preserve and spread the native Hawaiian arts. 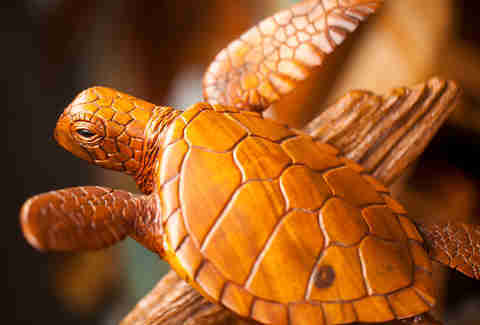 Wood sculptures from the skilled hands of various master carvers carry on one of Hawaii’s most iconic art styles. But it’s not just statues. These master carvers also make traditional weapons, kapa drawings, and oversized on-site sculptures. The Naeata family -- father Tonu and sons Sini and Hamani -- bring “the culture of the islands into vivid focus” through rich woodwork that rewards the sense of touch as often as sight. For diverse cultural programming, this is the place to learn classics like palm weaving, hula, lei making, and more. The Royal Hawaiian Center offers complimentary classes and live entertainment to immerse you in culture firsthand. With all you’ve absorbed by now, you’ll be itching to try it for yourself.